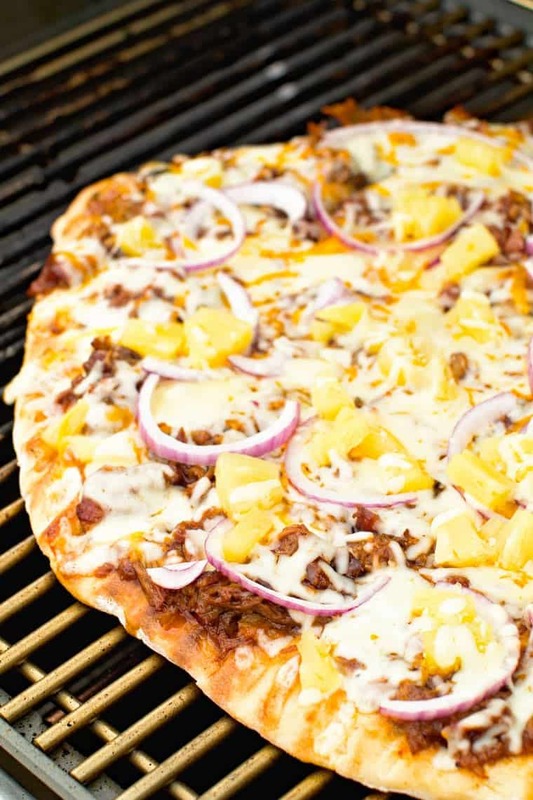 This delicious BBQ Pulled Pork Pizza is made on the grill using leftover pulled pork from your smoker! 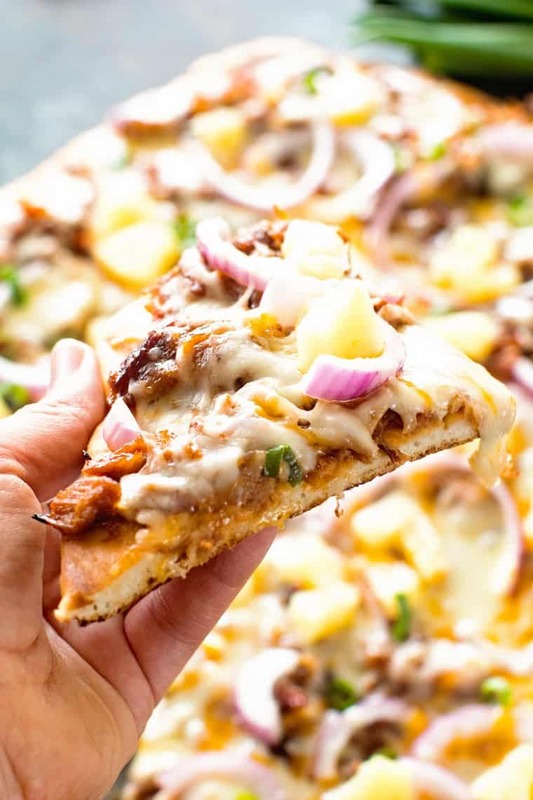 Perfectly crispy grilled pizza dough topped with BBQ pulled pork, bacon crumbles, red onion, pineapple and three different kinds of cheese! Grab a slice today! I’m having so much fun making new recipes with leftover pulled pork like enchiladas and grilled pizza recipes! I forgot just how much I enjoy grilled pizza. 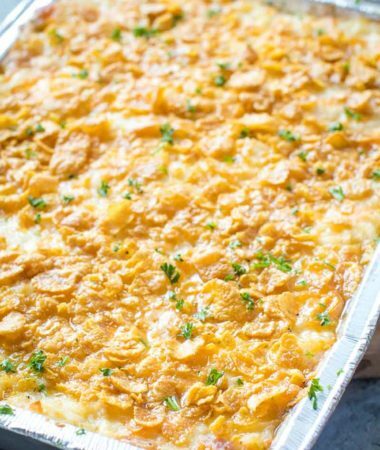 It ranks over baked pizza any day in my life. That crust is crispy on the outside and chewy on the inside. This time I made a delicious pulled pork pizza with leftover pulled pork from my Smoked Cider Brined Pulled Pork. I topped it with bacon crumbles because bacon is life, right? 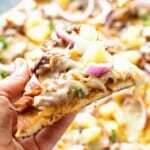 Then piled on pineapple, THREE cheeses and red onions. Heaven. 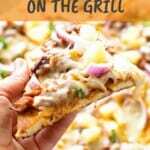 If you are looking for a grilled pizza recipe that is a little more “safe” make sure you check out my 3 Meat Pizza. My husband definitely prefers that version of grilled pizza, but I adore this one. He tends to stay a little bit more on the “safe” side of things. That’s why when I made this one I invited my Dad over to taste test it. He gave it rave reviews, in fact he told my Mom he had a tummy ache afterwards because he couldn’t stop eating it! I’d say that was a success. My Mom was out of town for the day so I sent the leftovers home with him and she put them in the oven to warm up for supper. She loves when I send extra food home with them so she doesn’t have to cook. It’s one way I pay her back for everything thing she does for us! That lady is my best friend and my savior. Seriously. She takes care of my kids, helps me recipe develop and everything in between. For example, today she is going to come help watch the kiddos because I’m keeping them out of daycare. Apparently Influenza A is going crazy around town and I’m trying to seclude us as much as possible. It’s the middle of April, aren’t we done with this stuff yet? If it would ever warm up and we could get out of the house that would probably help, but it seems that this spring is like a second winter. I’m hoping that means fall will be nice and long, right? A girl can hope and pray. Tips for Making Grilled Pizza! You can use either your favorite homemade pizza dough or a store bought pizza dough. I prefer a homemade dough because it seems to be thicker and hold up better. When you grill the first side, grill only a few minutes or until it’s set. Otherwise it will get over cooked when you put the toppings on and grill it longer! If you have a lot of toppings to assemble, pull the pizza off the grill and then top it. Then put it back on the grill instead of flipping the dough and assembling on the grill. 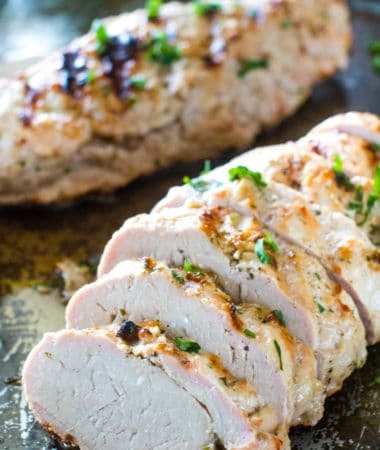 It gives you more time to work with and stops the cooking process. After flipping grill just long enough the cheese is melted and toppings are warm! You don’t want to overcook it or it will be really chewy. Use FRESH cheese. Grab the block of cheese and grate it. This makes all the difference. The cheese melts better and it’s amazing. 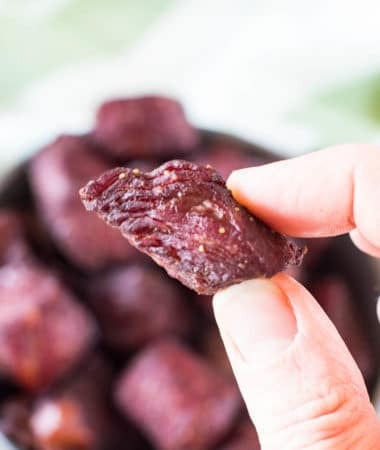 I just use a little hand grater and it’s so easy! It will take your pizza experience to the next level. Just take the extra two minutes and do this! If you don’t have leftover pulled pork substitute store bought pulled pork. 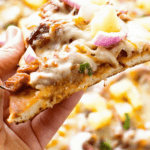 This delicious Pulled Pork Pizza is made on the grill using leftover pulled pork from your smoker! 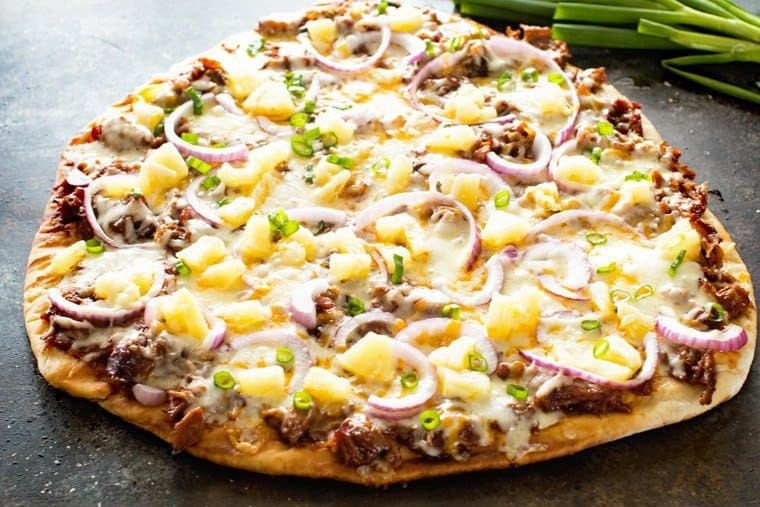 Perfectly crispy grilled pizza dough topped with BBQ pulled pork, bacon crumbles, red onion, pineapple and three different kinds of cheese! Grab a slice today! Preheat grill to 500 - 550 degrees. In a small bowl mix together pulled pork and bbq sauce. Set aside. Place pizza dough on grill, olive oil side down. Brush top of dough with olive oil. Cover grill and cook 1-2 minutes. You'll want the dough set, but not crispy. 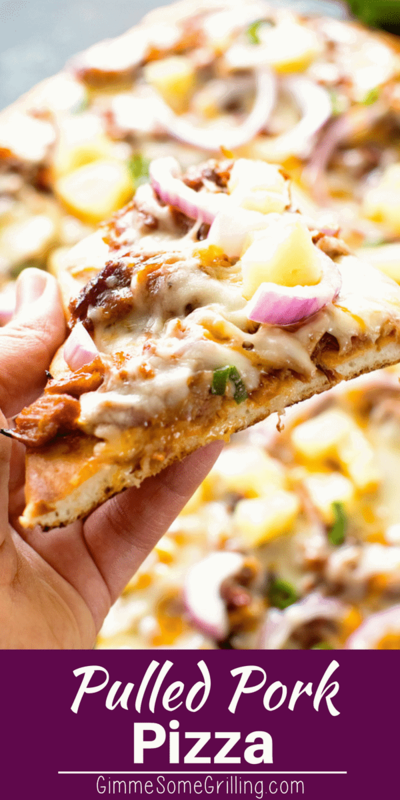 Flip dough over, top with bbq pulled pork, bacon, red onion, pineapple, and cheese. You want to do this quickly, if you want to take more time, remove pizza dough and top then place back on grill. Cover grill and grill 3-5 minutes or until ingredients are hot and cheese is melted and the crust is crispy around the edges. Remove and let sit 3-5 minutes. Top with sliced green onions if perferred. Cut and enjoy!